At the beginning of this series, I said that the two biggest components to reversing my diabetes was changing my diet and increasing my exercise. The last post covered exercise and this blog post is my simple attempt at describing how my diet changed everything! Back in the early 2000's it seemed like every other patient had a problem with something in the environment. One of the ailments that kept creeping up on the health history forms of my dental patients was something called: "gluten allergy/sensitivity." If I'm being truthful, at the time I thought it was a bunch of hooey. Seriously people. Who has an allergy to grains? It's a staple food all over the world. Why is this not a pandemic issue? I was no longer bloated after a small meal. I literally stopped burping and farting. I was not foggy headed. I did not need to get a blood test. The anecdotal evidence was in: Stay away from gluten and you will feel better! The liver issues I had caused me to reduce the amount of iron rich foods (Remember though, I was still treating the symptom, not the cause). I also discovered that a modified Atkin's diet helped to lower my liver enzymes and ferritin levels. I was not putting all the pieces together yet, but I was still learning. It's important to note here: I had a wife who was on board with every dietary change that I brought home. I think it's because Kendra wanted me to stick around for a little while, so every health change brought dietary changes and she was helpful to do what it took to take care of me. Seriously, I cannot overstate how important this was. She was and continues to be my biggest cheerleader and top chef! The number one reason this series was written was because of her encouragement. We all need support and I could not do this without her. About this same time, my friend and functional medicine doctor got involved. He was encouraging me to start a gluten-free, dairy-free, and sugar-free diet. It seemed aggressive, but he had seen great results with his patients curing many issues by starting with controlling gut bacteria that was driven by sugar and dairy. He also knew (like my anecdotal results indicated) that gluten was a major player in inflammatory disease. Let me pause one more time: our farming processes have changed. Our grains are different than they were when we grew up. The gluten we have in our food today is an inflammatory ingredient. If you are gassy, bloated, tired, groggy and have sore/stiff joints - just try super hard to give up gluten for 1 week. I promise you will just feel better. The only problem was that his plan involved an entire system or a program to get things dialed in. I just wasn't there yet and wasn't willing to commit the time and effort to "following a plan." There was also the investment in all of the necessary blood test and supplements to get me on board. In retrospect it sounds good, but at the time it was going to take a lot more than just his advice to get me on board. 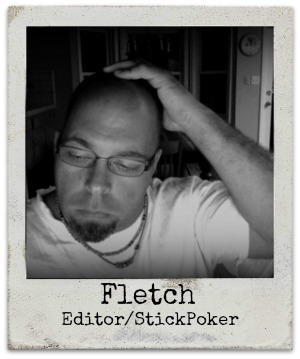 I know, most of my loyal readers like to believe in the "Myth of Fletch." To some extent I probably help to propagate the myth. Folks, It's not all blenders, Fuzz Buzzes and Margarita Machine drinks around our house. At one point after my diabetes diagnosis I had chosen to go alcohol-free. The gluten in the beer bugged me and most wines would turn my ears bright red. The math was simple. Alcohol + Fletch = uncomfortable. So, I dropped the booze and chose to feel better. No judgment. No higher cause. I just like water and iced tea more than waking up in pain. Let me remind you what was going on with my life at this point. I had descended into poor health: weight gain, hypertension, fatty liver disease, and type 2 diabetes. At the same time, I was stressed out and dealing with depression. I had started walking and exercising and began to see small changes in my life, but all the pieces were not coming together yet. It took that final piece that I've already mentioned in a previous post. After selling our home, I was finally able to see the light at the end of the tunnel and catch my breath. That's when I was shocked (literally) by my college neon Corona Beer sign. The electricity and subsequent muscle contractions led to a torn shoulder muscle. This led to a visit with an orthopedic surgeon which eventually led to a cortisone injection in my shoulder. Cortisone and blood sugars don't play well together, so my testing numbers took off. It took a long time for me to bring them back under control. Funny enough, it was this little incident that pissed me off and made me realize it was time for me to understand my body chemistry. Crazy changes for Fletch's body! I had begun to research how to reverse Type 2 Diabetes and the answer I kept returning to was the Ketogenic Diet. Funny enough, this was essentially the same diet my friend/doctor had recommended. So, I studied, researched and jumped in to this new way of eating with both feet. It was all me with my own handpicked vitamin/mineral supplements. I began to feel good immediately, but it took about 6 weeks before my blood sugars dropped to normal and my HbA1C gave me the results I mentioned in the Introduction to this blog series. As the weight came off, people kept asking what this diet looks like on a day to day basis. That is partially why I am writing this blog series. My best advice comes from the world of podcasts. If you really want to know more about keto eating, I want you to go over and listen to the 2 Keto Dudes podcast. Start at episode 01 and listen through the first twenty shows. They are short shows and these guys do a fantastic job of explaining the ketogenic lifestyle. They use just enough science to explain it to a doctor, but not too much to bore the audience. Yes, it's a lot of listening, but if you are serious about wanting to change, this is a great start. Remember it is going to take commitment. It's also going to take others to support your choices. The Keto Dudes have created a great community and they are the best thing to help you get started and stay motivated. This was the tipping point in changing my health. This eating plan was the number one reason I dropped weight and changed my blood numbers. Daily Carbs = 0-25g - Just what I get in green leafy vegetables (otherwise the number is ZERO). Daily Protein = 1-1.5g protein/kg of lean body mass. For me, that is approximately 90g protein. Daily Fat= As much as I can eat to satiate me. Yes, it's a high fat, low carb and low protein diet. As I type this right now, I'm down nearly 50lbs from where I started. I'm rarely hungry and my energy level is sky high. My exercise level is never inhibited by my eating or lack of eating. I fast intermittently and really only eat when I'm hungry. Which causes many to ask where all my energy comes from? When you switch to a ketogenic diet, you no longer rely upon glucose to burn for energy, so you no longer convert your unused glucose to fat storage. Since you don't have excess glucose, you don't need as much insulin to deal with the extra glucose in your blood. (If you have paid attention, this means your liver is also not stressed out and throwing high enzymes). Here's what changes: Your body stops looking to glucose for energy and learns to burn your stored fat for energy. Remember all those years you were eating Krispy Kremes, pizza and slurping down beer? All the extra glucose in those foods was stored as fat for future energy. When you convert to ketogenic eating, all of that stored fat becomes your primary source for energy. The truth for me: I HAD A TON OF STORED ENERGY (which is the new politically correct way to say that I was FAT!) I have an untapped source for energy and it's all the fat I've stored around my belly, my liver, my other abdominal organs. As the weight has come off, my fat stores are being depleted. The before and after photo above says it all. The proof is in the picture. My story is done! I cured my Type2 Diabetes by taking control of my life, diving into the dark corners, allowing others to help and support me, taking on an exercise routine that worked for me, changing my diet, and remembering that each day was a new day and I had to make changes. Thanks to everyone I've previously mentioned for helping me make so many positive changes in my health, but especially my wife Kendra (go read her stuff - she's brilliant), my friends/doctors (Blankenship, Beech), my cancer doctor at Stanford (Dr. Peter Whang), all of my friends at Mid-Aged Maniacs (especially Laura), and my dogs Betty and Rasta! Thanks for reading along...but don't leave just yet! Now is the time for you to make a decision. Do you want or need to make a change? It took me a long time to get there. Maybe this blog series has pushed you over the edge? Maybe it's the other mid-aged maniacs you read about? Maybe it's your own blood tests? I don't know. Do you want my help? I'm not running classes. Just helping friends who were stuck like me. I've seen the changes and I think you will see them as well. If you want help, click this button below. Let's do this! YES FLETCH! I want to make a change! PART 8: Get Out and Get Walking! PART 9: Kicking Sugar to the Curb!